My only request was that mom was able to start off at the Water Park renting a family size locker so I didn’t have to haul our beach towels, swimsuits and snacks all day through the park. Once relieved of my responsibilities thanks to a nifty, high-tech locker (no key to lose; it opens with a wave of a wristband), I gave the kids the map and let them plot out the day. Our plans to hit the water park at the end of the day changed as the sun grew warmer and the lines longer. We all wanted to cool off. We were lucky and the water park was not packed. There was no wait for the three giant water slides. My favorite was the Orange Rush because it has a big rubber boat that holds four people, so families can slide down a huge sluice together, twirling and screaming (me), but really a fairly gentle ride. My daughter Rose and her friend Molly liked the Twin Chasers, twisting red tubes placed side by side so you can see who splashes out first in a race. Angelo was not up for climbing the big staircase to the slides. 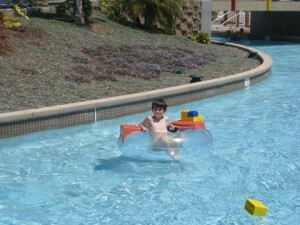 He enjoyed the “Build a Raft” river where he added LEGOS to his inner tube along the way. He also enjoyed spraying unsuspecting kids in the Joker Soaker two-foot deep pool with waterfall, and water guns. Mom was happy with the lounge chairs placed throughout the park so I could watch the kids have fun with my feet up and 75-degree sunny weather shining down on me. After lunch, we changed back into our clothes (the fancy lockers are conveniently located next to individual, private changing rooms) and set out for our main goal of the day, the new Miniland Star Wars exhibit. 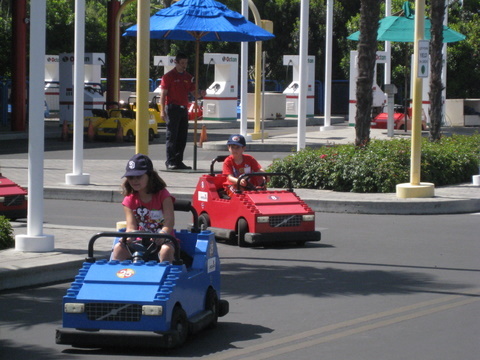 While LEGOLAND is geared for younger kids (it’s a great place to get your first taste of a not-too-scary Coastersaurus), Miniland is a marvel for all ages. My son went on and on about the different classifications of droids and searched for Darth Vader lurking throughout the seven new exhibits. The favorite for all of us was the Ewok forest. We could see the moving LEGO characters on the forest floor, and then noticed the cool tree houses with lots of Ewoks hanging about in the tree tops, really at kid’s eye level. After Miniland, we headed to the Project X Technics coaster. I’m a total coaster wimp, and last year when we visited I had to go on this coaster with my daughter because no one else would. It gives the illusion that you are going to fly off the track, only turning at the last minute. This time, my daughter was old and tall enough to hit the tracks with her friend Molly, so Angelo and I could sit on a bench and wait to see their screaming faces. Rose, my daughter thinks this is the best coaster at the park. Once she conquered this one last summer, she was unstoppable at other parks. We ended the day in the Castle area with ice cream and two more rides. Then mom emptied the locker, Angelo cried because we didn’t get to visit Octopus Garden, and we all consoled him by discussing what we’d explore on our next visit to LEGOLAND. This post was written by local mother, Sarah Weinberg-Scalo. Sarah lives in North Park and enjoys dining and playing with her kids all over San Diego county. This entry was posted in Attractions, Family Vacations and tagged children, family, friendly, kids, legoland by Guest Blogger. Bookmark the permalink. Sounds like fun, but a highly pertinent aspect of this day would be to know how much was spent in total.